It was in the dead of night! actually 10pm, that Chris and myself plus Hubby, went to our Association Apiary to pick up a Nuc of bees that Kevin had put together. Chris knew what he was doing I am glad to say and this was quite an experience for a Newbee. Moving bees in the night is not easy. We were taking them to Mary Arden’s Farm. It is recorded that there were bee hives in Mary’s garden. Who knows, she may have been the beekeeper or assisted her mother. We got to the farm and were greeted by Andy the Farm Manager. Andy joined us last year and has come from ‘Adams Farm’ and is keen to promote rare breed animals including bees. Anyway, we took the Nuc to the new hive which is under trees and behind the pond. It’s quite dark here and I forgot the torch! So no time to lose, we had to unwrap this lot and get on with it. Chris told me to feel for the bees and I can tell you it was getting a bit scary. Phoebe our queen was not happy at this intrusion, in the dark and in the cold and she made sure we knew it! It was quite a spectacle to see the bees make their way up the white sheet. Phew! all in and we closed the lid. There were a few flyers about but all was well. The only casualty of the night was Andy, who got stung while putting up the Health and Safety notice. Doh! In Tudor times the Bee was regarded as sacred. It was thought to be the only creature to come out of the Garden of Eden with all their graces intact. Hence, only bees wax was used in church candles and many churches kept hives. Referred to poetically as Muse Birds, I can understand this reference as their intelligence and industry is surprising and inspiring. 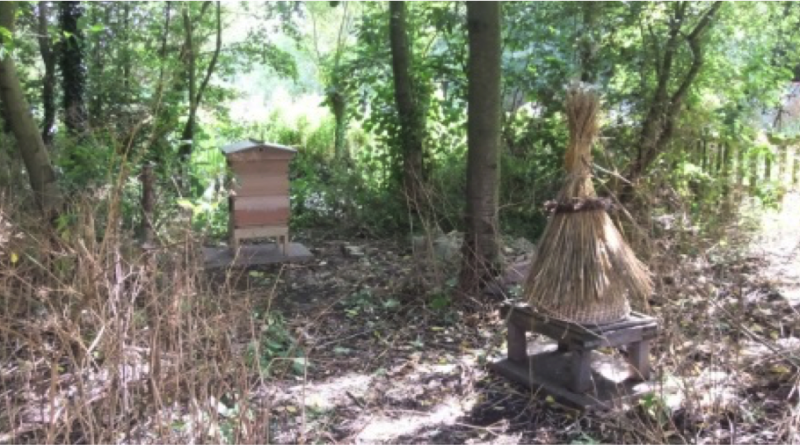 The image shows the new national hive near the pond and the Tudor skep with its hackle in the foreground. I hope to be able to keep bees in the skep in the future.